The ultimate determination of the (market) value of an improvement is not merely a factor of function (square footage, bedroom count, etc.). Yes, you need these things (you can’t fall in love with the girl without the girl), but the buyer’s emotional response also influences the market value. My friend Tal called me the other day. A carport in his backyard blew over, and he wanted to know 1) if he should replace it, or 2) if there was an option that would better increase the overall value of his property. I told him a carport is, well, kind of boring, and that replacing it would be a practical option, but nothing more. I suggested he think of a carport as dress socks; you may need them, but you’re not going to fall in love with them. 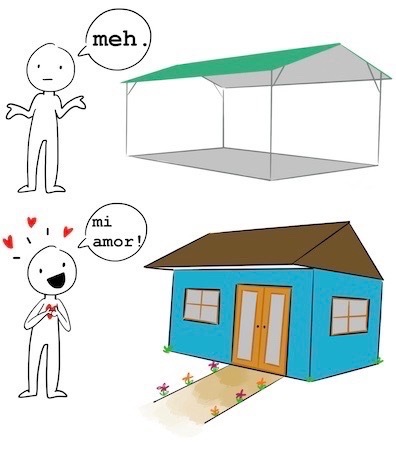 A carport elicits no emotional response; a buyer won’t fall in love with a carport. And if a buyer won’t fall in love with it, it has limited market value. I recommended Tal invest a bit more money and instead build an also functional, but much more attractive (and emotion-inducing), ‘studio’/storage shed. This kind of structure still makes great use of the backyard space, but, built the right way, gives a person something to fall in love with. Emotion/love = increased market value. What I’m talking about here is hard to define. The best metaphor for this emotion that I can think of is falling in love. Falling in love with a girl, for example, or falling in love with a feeling. Starbucks and Whole Foods spend millions to elicit an emotional response from you, and the smartest builders pour more resources than you might imagine into making their model homes perfectly easy to love. We usually don’t know it’s happening, but emotion drives many of our decisions and habits, and it certainly directs buyers in their search for a new home. Don’t get me wrong; there is (market) value to be had if an improvement serves a function (added square footage, a covered parking spot for your car, etc. ), but elicits no emotion. But the problem is if you don’t make the change ‘lovable,’ there is an excellent chance you will put more into the improvement than is gained in market value. If the change you’re making is something you’re doing just for your enjoyment, or maybe because it’s something needed for your family, that’s great. We merely want you to know that every change is not necessarily worth the investment from a market value standpoint. If you’re planning an improvement to your home and if you would like to know how (or how much) it will affect market value, give us a call — we’d love to help.